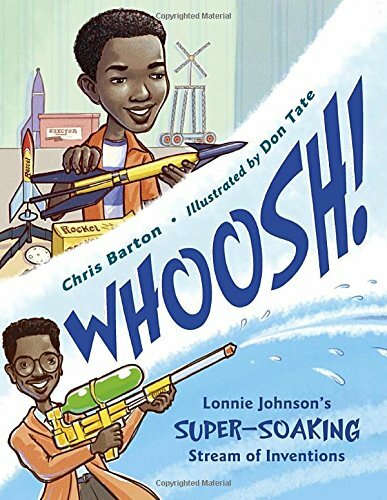 Booktalk: The Super Soaker is one of top twenty toys of all time. And it was invented entirely by accident. Trying to create a new cooling system for refrigerators and air conditioners, impressive inventor Lonnie Johnson instead created the mechanics for the iconic toy. 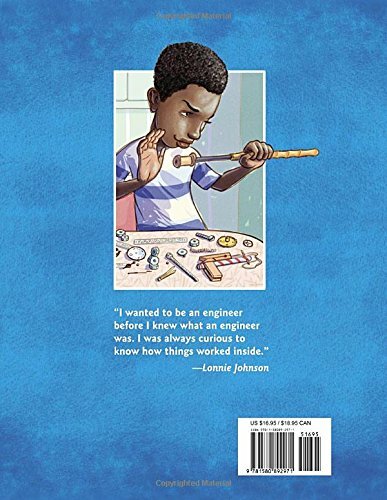 A love for rockets, robots, inventions, and a mind for creativity began early in Lonnie Johnson’s life. Growing up in a house full of brothers and sisters, persistence and a passion for problem solving became the cornerstone for a career as an engineer and his work with NASA. But it is his invention of the Super Soaker water gun that has made his most memorable splash with kids and adults. Snippet: When NASA was sending an orbiter and probe called Galileo to Jupiter, the space agency needed to ensure a constant supply of power to the computer memory. The engineer who had to figure out how to do it was Lonnie. Don is one of my former students! Engineers use the principles of physics to design and build machines, tools, and houses. Biologists study living things. Mash them together and you get Bioengineers: people who apply engineering principles to biological functions to create something people use. Take Leonardo Da Vinci. He studied how birds and bats fly, and then designed a flying machine. He may have been the first person to document his use of bioengineering- through notes and sketches. Bats use sonar to find the fruit and insects they eat. They send out a sound signal that bounces back off objects – letting the bat know where their dinner is. Submarines use sonar, too, and now engineers have developed walking sticks with sonar that will help blind people navigate more easily. Pretty cool, right? 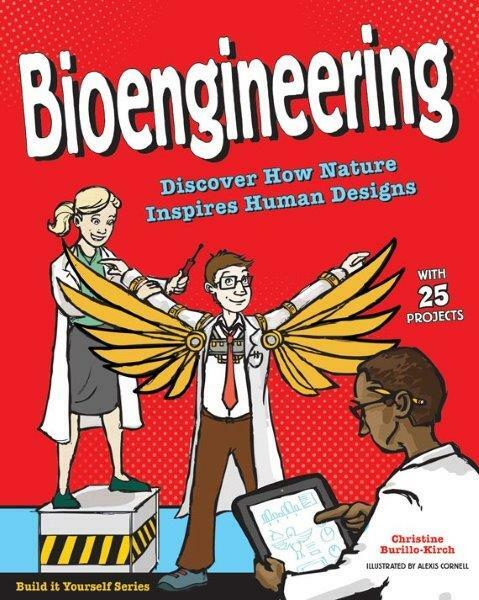 This book introduces kids to a wide range of applications of bioengineering, from medical applications to wind power, farming, clothing, architecture, transportation, and 3-D printing. There are 25 hands-on projects, including “backyard bioengineering”, and tons of links to primary sources. Back matter includes a glossary, resources (including a list of QR codes) and an index. Head over to Archimedes Notebook for links and more about Da Vinci, Velcro, and maple-seed-inspired flight. When spring comes, the seeds that are in good soil begin to germinate. They will grow into new plants, and the whole life cycle will begin again. There may not be a flower that is more fun to grow than the sunflower. They are a no fuss bloomer that can grow to twice your height. It’s also one of the easiest seeds to use with young children who love to fill a plastic bag with dirt and wait for the magic to happen. My previous class planted seeds on Earth Day and now the plants are ten feet tall! Now if you’re going to do this, you should have a literacy tie-in. Seed to Sunflower tells the story of the humble sunflower as it sheds its seed coat and climbs to greatness. Three things stand out about this informational text. First, it’s loaded with text features that are just right for the K-1 crowd. Lots of labels here with diagrams that illustrate the process of the life cycle. Second, the photographs are dazzling and huge which makes it perfect for the primary crowd. Third, it’s loaded with science vocabulary. Young readers, with the proper scaffolding, will enjoy using these words to impress their parents and friends. 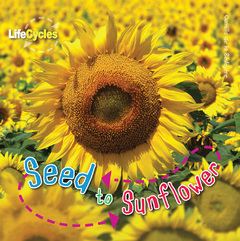 Seed to Sunflower, besides being a good science book, would be a great source for teaching sequence. You can take one of several two page spreads and use it for a mini-lesson. Students can also use this book to compare the plant life cycle to other life cycles such as animals and humans. Booktalk: From slowing wildfires to planting seeds, one animal is the true superhero that keeps the African savanna in balance. Elephants dig to find salt that other animal lick, their deep footprints collect water for small creatures to drink, and they eat young trees to keep the forest from overtaking the grasslands. In every season, the elephants are there to protect the savanna and its residents but what would happen if the elephants were only once upon a time ? Discover the important role this keystone species plays in the savanna and explore what would happen if the elephants vanished. 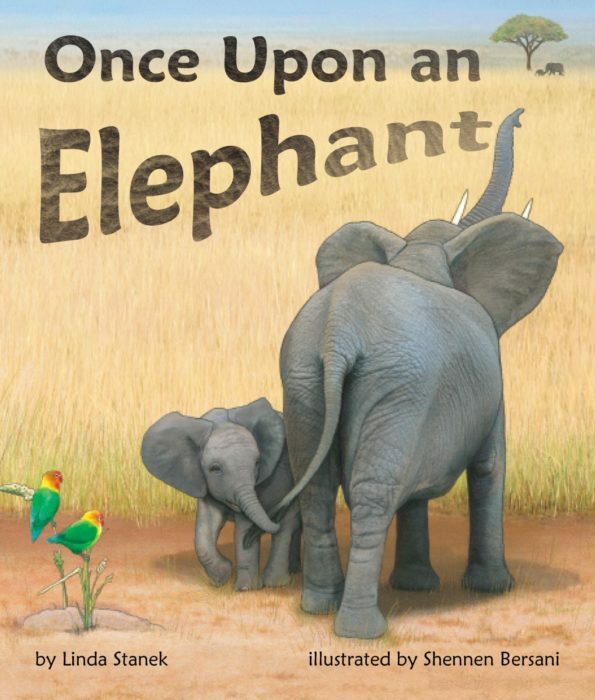 Snippet: Once upon an elephant, the sun beat down on the hot, cracked earth. Rivers ran dry. The animals of the savannah risked dying from thirst. But the elephants were there. They dug in the riverbanks with thier tusks. They cracked the hard soil, shoveled through mud, and reached water. And the animals gathered ’round and drank. Linda is one of my former students! 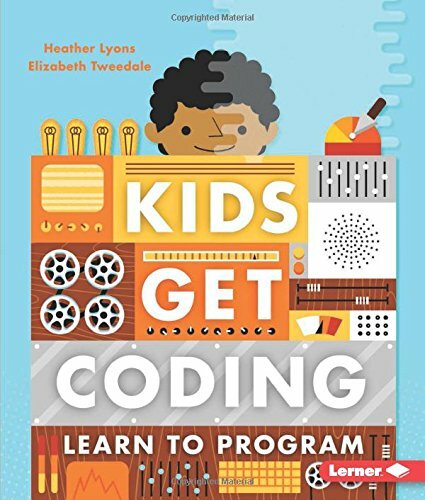 Booktalk: What do programs tell computers to do? And how are they written? Programs are instructions that computers follow. Learn about different programming languages, coding rules and bugs, and how to solve problems. Snippet: Our brains can connect meaning to instructions. For example, if someone said “Go down to the slide,” we would understand that they mean for us to first walk up the steps, sit on the slide, and then slide down. 1. Walk to the steps. 2. Climb up the steps. 3. Sit on the top of the slide. 4. Slide down the slide. 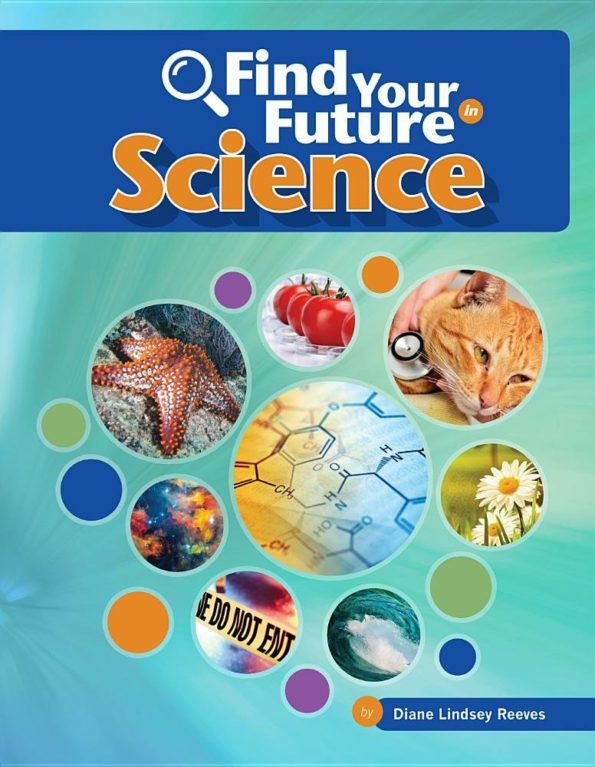 Booktalk: Find Your Future in Science introduces 8 high-interest science careers via reader-friendly profiles and sidebar features that inspire extended learning, online research, and critical thinking skills. Back matter includes additional learning activities. Snippet: Young scientists start by asking lots of questions. Why? How? What if? Curiosity keeps them exploring. Every fascinating discovery lights a spark, an idea, an interest, a connection. Before they know it, they are hooked. Science is awesome! Then they find out that can grow up and be a scientist. What? You mean that companies will actually pay you to do science as your job?